The most pleasant intersection of summertime BBQ staples, the Churger is half hamburger, half grilled chicken and all right by me. I’ve been going to Reading Phillies games for close to 30 years now (wow, that feels weird to write – am I that old?) and one thing you can always count on is great food. 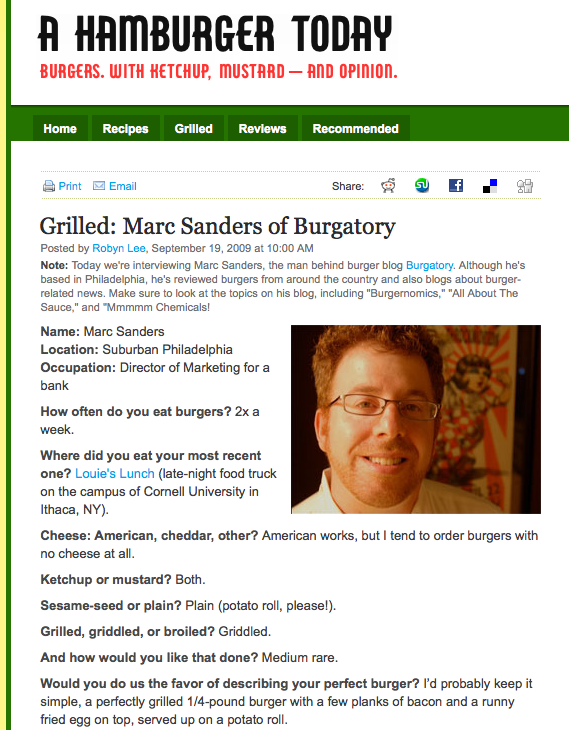 For years it was hot dogs and french fries and most recently it has been the burgers. 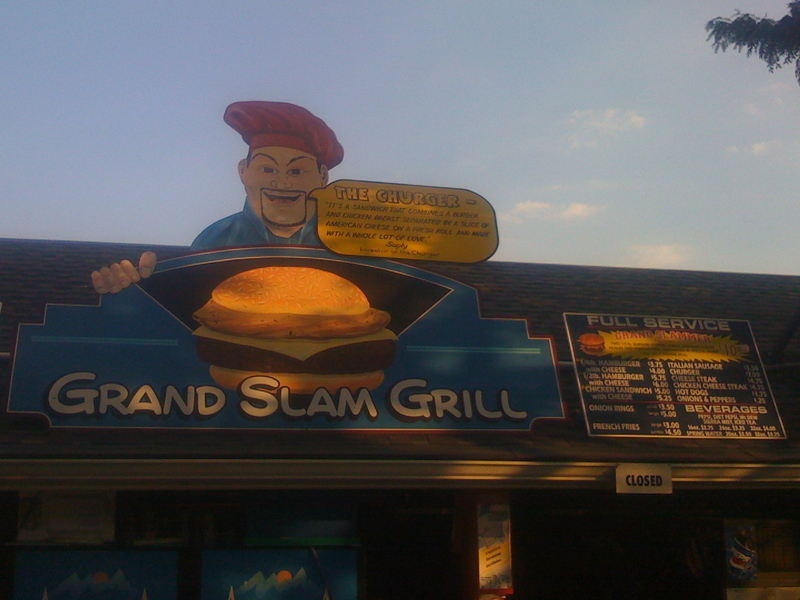 The Churger hybrid no doubt comes from the R-Phils cooks flair for experimentation which a few years ago birthed “The Grand Slammer” which is a deadly combination of two 1/2 half pound burgers, cheese, sauce, pickles and oh, yeah…a half-ton of french fries, all wrapped up in a bun. At $10/per it might give you sticker shock, but have no fear it can easily feed a family of 4. Scoly is Jamie “Scoly” Scolastico who runs the outpost and is deserved of his name in lights (or at least on paint) for this invention. The $7 sandwich itself is a 1/4 lb. 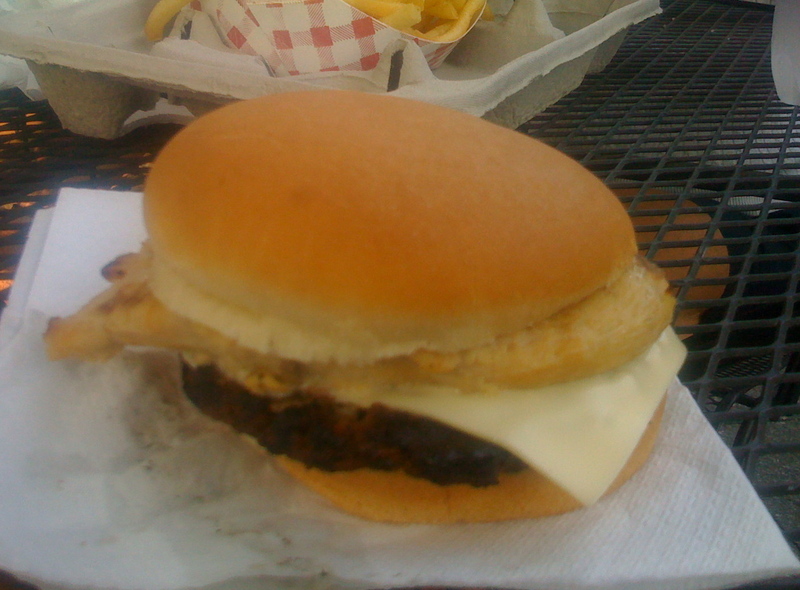 hamburger and a similar sized chicken breast, char-grilled and kept from co-mingling by a slice of cheese applied during burger construction. No need for condiments of any kind because both the burger and the chicken were perfectly cooked and juicy. Besides maybe BBQ sauce, I’m not even sure what condiments you would put on it if you so decided they were necessary. I can’t wait to catch another game (and burger) in Reading. This place is a perennial winner for a great family night out and the food just puts it over the top. Saw Pedro the other nite at my first Reading Phillies game. Got the regular burger with onions and peppers. Where do they get their burgers? Probably was Angus but was not sure. Please advise. According to the folks over at the R-Phils they are Angus burgers and they are from Devault Foods through Van Bennett foods.